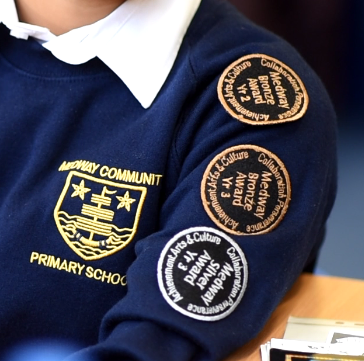 At Medway, we aim to bring our values into every aspect of our teaching and learning. Children experience and learn about our values through our ‘Keys to Success’ reward scheme and ‘Bigger Picture’ curriculum. Together we are a T.E.A.M.! Medway has a collaborative and inclusive ethos. In our lessons we focus on oracy and group work, which both motivates pupils and provides them with essential skills for their academic and post-education lives. We ensure that every pupil is provided with the support and facilities that they need to succeed and work in a partnership with parents to ensure that the needs of all pupils are met. As part of the wider community, Medway is the location for activities such as adult ESOL (English as a Second Language) classes and a local Madrassa. We also provide families with help and support by providing translation services within school, workshops for filling in necessary forms and dedicated Community and Family Liaison workers. Support for pupils with Special Educational Needs is a priority at Medway. For further information, please visit our 'SEND at Medway' page or contact Mrs Niners our Special Educational Needs Co-Ordinator (SENCO). We also provide a wide variety of enrichment activities and support for pupils who qualify for 'pupil premium' funding. To find out more, please visit our 'Pupil Premium' page or contact our Year 6 teacher Miss Hill, our Pupil Premium co-ordinator. We believe that pupils’ unique skills and talents should be nurtured and do so through our High Prior Attainers (HPA) scheme using a variety of targeted enrichment opportunities. For information about extra-curricular activities, please ask at reception.